BLOCKBUSTER musical Les Miserable is returning to the Melbourne stage following its worldwide success on the big screen, it was announced today. The acclaimed new production, which inspired the award-winning movie, will premiere at Her Majesty’s Theatre in June next year with a cast of “future stars”. 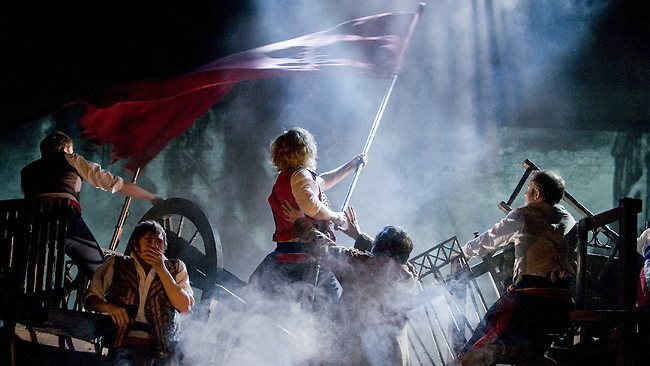 Producer Cameron Mackintosh said the phenomenal achievements of Les Mis on stage and screen were “a dream beyond any dream I’ve ever had”. First performed 28 years ago, it has been seen on stage by more than 65 million people in 42 countries. The film version now has a global box office of 400 million. Together they have amassed almost 100 major awards and go into tomorrow’s Academy Awards with eight nominations, including best picture. Mackintosh is in L.A. for the awards season with the stars of the film, Anne Hathaway, Russell Crowe and Hugh Jackman, who is up for the best actor Oscar. “None of us could have imagined Les Miserable would be so successful, let alone for us to walking the red carpet possibly up for a few prizes,” he said. The stage remake of the show premiered in London three years ago to celebrate its 25th anniversary and will open on Broadway and in Melbourne in 2014. Mackintosh said he hoped the new Australian production of Les Mis would follow in the footsteps of his last major Australian show, Mary Poppins, with a long Melbourne season and then a national tour. First staged in Australia in 1987 – and last seen 14 years ago – Les Mis launched the careers of a long list of stars including Anthony Warlow and Marina Prior. Mackintosh said he wanted the new production to do the same for the next generation of talent. He said casting would begin next month and he would be in Australia for final auditions in May. The 25th anniversary production has been directed by Laurence Connor and James Powell and designed by Matt Kinley. The Australian team will be led by executive producer Michael Cassel and casting director Serena Hill.